Over the past few month, I had multiple opportunities to work with latest Sitecore Install Framework, my experience was very positive, and even though, I’ve seen more struggle with this new approach, I personally strongly believe that having the ability to script your environment provisioning is the correct way to go and it fits DevOps paradigm very well. There are few critical changes that we must understand before start provisioning of our Sitecore 9 instance. First, we need to secure communication between XDB and Sitecore website and second, we need to install Solr. To get started with 9 please review this Sitecore Compatability table and this one for Solr. Also, please review Sitecore Installation Guide as it is the most comprehensive source of information for Sitecore 9 installation. Before installing Sitecore we need to ensure our system is configured correctly. Sitecore Install Framework error messaging could be deceiving at a times and as such having proper system configuration is essential. I recommend starting with a fresh instance of Windows Server 2016 installed on Virtual Machine. Navigate to Server Manager->Dashboard and click on “Add Roles and Features”. 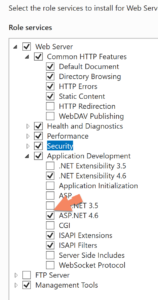 Install IIS and .NET 4.6.2 as shown below. Download and Install Web Platform Installer 5 and add Url Rewrite 2.1 module and WebDeploy 3.6 For hosting Servers modules. Note:Newer versions of Solr will not work. “C:\Program Files\Java\jre-9.0.4\bin\keytool.exe -genkeypair -alias solr-ssl -keyalg RSA -keysize 2048 -keypass secret -storepass secret -validity 9999 -keystore solr-ssl.keystore.jks -ext SAN=DNS:localhost,IP:127.0.0.1 -dname "CN=localhost, OU=Organizational Unit, O=Organization, L=Location, ST=State, C=Country"
Update the C:\solr-6.6.2\bin\solr.in.cmd file by pasting the following code block at the end of the file. Ensure this code block matches what you used as the certificate name and password during the certificate creation and installation process. 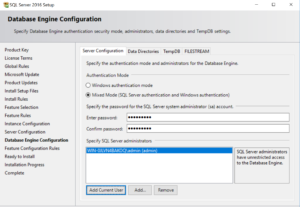 Important: Test Solr installation by navigating to this URL: https://localhost:8983/solr/. 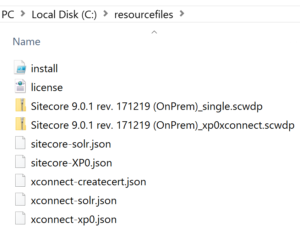 Do not continue with Sitecore installation until Solr interface is shown. From the “C:\resourcefiles” directory, run the installer script from the (elevated) PowerShell console. .
Test that Sitecore was installed correctly.